Recommended for Lectrosonics or any other UHF Receiver or Transmitter with BNC connectors operating between 486-900 MHz (Lectro Blocks 19-33). 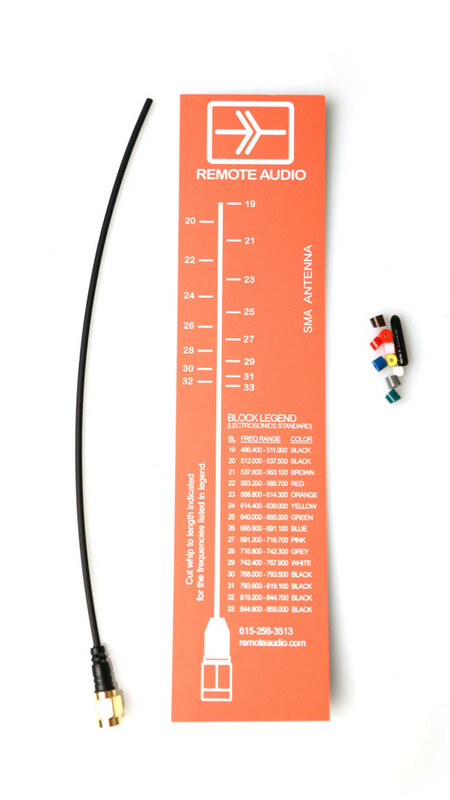 Includes frequency trimming chart and color coding bands. Ultra Flexible BNC flexible antenna. Recommended for Lectrosonics or any other UHF Receiver or Transmitter with BNC connectors operating between 486-900 MHz (Lectro Blocks 19-33). Includes frequency trimming chart and color coding bands. This antenna is good for bodypack use as it is less rigid than the Miracle Whip type antenna. Recommended for Lectrosonics, Zaxcom, or any other UHF Receiver or Transmitter using SMA connectors operating between 486-900 MHz (Lectro Blocks 19-33). 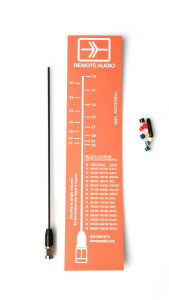 Includes frequency trimming chart and color coding bands. 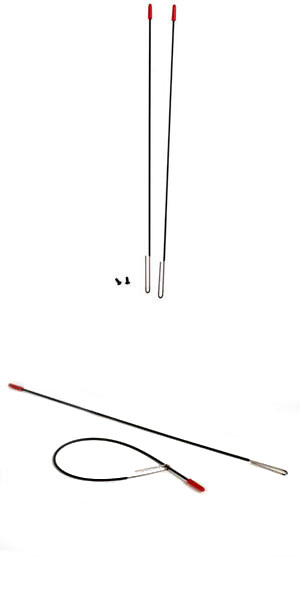 Ultra Flexible SMA Antenna KIT for Lectrosonics 200, 400 Series transmitter,190B/195B transmitter, Zaxcom ENG receiver. This antenna’s connector employs moulded-on strain relief. 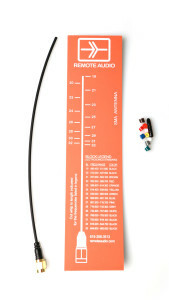 Includes frequency trimming chart and color coding bands. This antenna is good for bodypack use as it is less rigid than the Miracle Whip type antenna. Recommended for Lectrosonics or any other UHF Receiver or Transmitter operating between 486-900 MHz (Lectro Blocks 19-33). 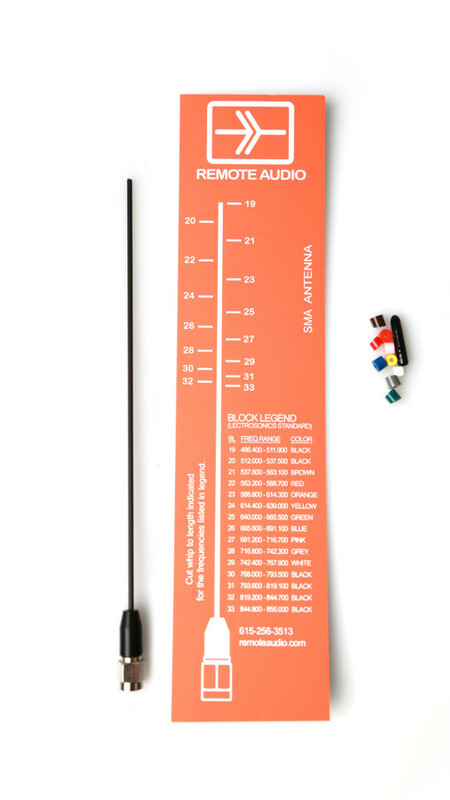 The Remote Audio “Miracle Whip” ANMW216 kit converts a popular UHF folding dipole antenna to use with 216mHz transmitters, such as the Comtek BST-216 or M-216 transmitters. The resulting antenna provides up to 6dB of gain, is omni directional around the horizontal plane, and is very easy to mount, fold, and pack. The element extensions are made of memory steel which is flexible but highly resistant to permanent bends. The MW216 kit includes two preformed elements ready for mounting, and two longer replacement screws. 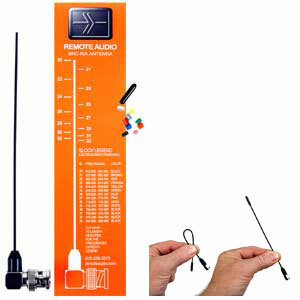 The kit can be ordered alone (installation is easy), or installed with the purchase of a new antenna. 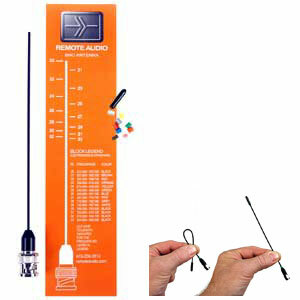 Converts UHF folding dipole antenna to use with 216mHz transmitters, such as the Comtek BST-216 or M-216 transmitters. 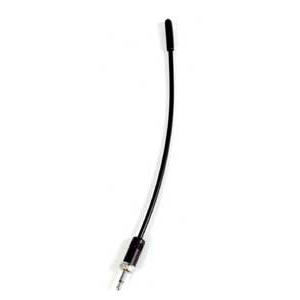 Flexible antenna with sub mini connector for bottom mount Lectrosonics beltpack transmitters (UM190/UM195).